Long-term trends in the sea surface temperature in the Canary upwelling zone and their causes are analyzed on the basis of satellite data from the 1980s until the present. It is shown that the wind activity has strengthened near the northwestern African coast during last 30 years, which is accompanied by local intensification of wind-driven upwelling. The northeastern trade wind weakens in the open Tropical Atlantic, along with the horizontal heat advection in the upper ocean layer, which leads to a decrease in the area of the upwelling waters. As a result, both tendencies partly compensate one another when the temperature is averaged over the region in the northeastern Tropical Atlantic (between 10°–30° N, 10°–25° W). We are grateful to the anonymous reviewer for constructive criticism of the first version of this paper. 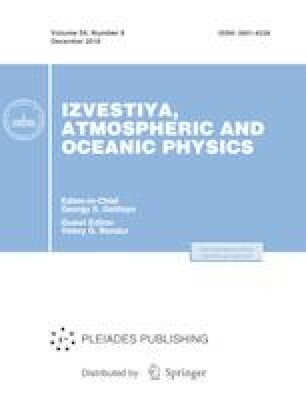 The work was performed within the Fundamental Research of Climate Processes that Determine Global and Regional Spatio-temporal Variations in the Environment State Assignment (no. 0012-2014-0009).